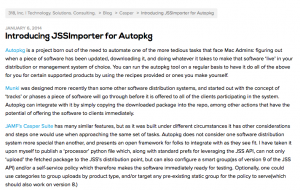 JSS-autopkg-addon Presentation from Allister Banks on Vimeo. On June 26th, I had the pleasure of being invited by @Tecnico1931 to the NYC Metro JAMF user group meeting. See also Shea Craig’s python-jss, and thanks go out to James Barclay, Sam Johnson, and all the folks mentioned in the video.